North Carolina Board of Public Charities Annual Report of the Board of Public Charities of North Carolina, 1910. 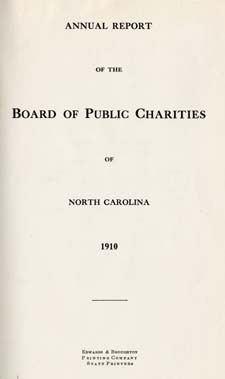 Annual Report of the Board of Public Charities of North Carolina, 1910. Raleigh: Edwards & Broughton, [1911?]. Blind -- Institutional care -- North Carolina. Deaf -- Institutional care -- North Carolina. Mentally ill -- Care -- North Carolina. Mute persons -- Institutional care -- North Carolina. North Carolina Board of Public Charities. Orphans -- Institutional care -- North Carolina. Poor -- Institutional care -- North Carolina. Prisoners -- Institutional care -- North Carolina. Psychiatric hospitals -- North Carolina. Public welfare -- North Carolina.